IM MELISSA,I AM 30 FROM NORTH CAROLINA.I STUMBLED UPON THIS WEBSITE BY MISTAKE ONE DAY AND I LOVE IT! IT HAS SO MUCH TO OFFER.I AM MARRIED.I DONT HAVE CHILDREN YET.I HAVE two PETs A bird and a dog.they are SPOILED ROTTEN! I LIKE COOKING AND CRAFTS.AND TIPS ON HOW TO MAKE LIFE EASIER. 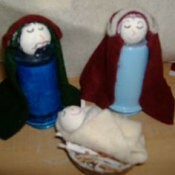 Nativity Made From Medicine BottlesI was thinking I wanted to make a nativity when I saw my husband's empty medicine bottles. I thought these would make neat people. Then the idea came to me. 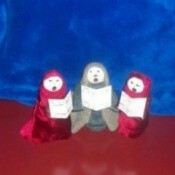 Medicine Bottle CarolersRecycled medicine bottles for carolers. I took 3 medicine bottles and turned them upside down. I painted the wooden balls a flesh color, let dry then painted faces with black paint. 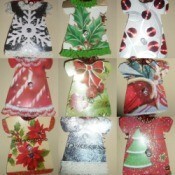 Christmas Card Paper DressesIf you have old holiday cards laying around and don't want to throw them away, why not use them to create these cute paper dresses. Jakie (Red Headed Conure)I'm not sure how old Jakie is. 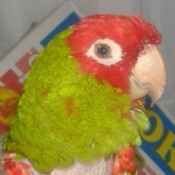 She is a Red Headed Conure. She was our grandmothers.